TropiClean Dental Chews for #SmoochUrPooch Fresh Breath and Clean Teeth! My Lady is back to talkin’ ’bout teeth and breath again. I think she’s on a mission to make us have the purdiest teeth ever! We’ve all been a drinkin’ that stuff in our water. I guess we are. Heck, I can’t even tell nothin’s in there, so that ain’t much fun! But, we’re gettin’ to have a TropiClean Dental Chew every day too! 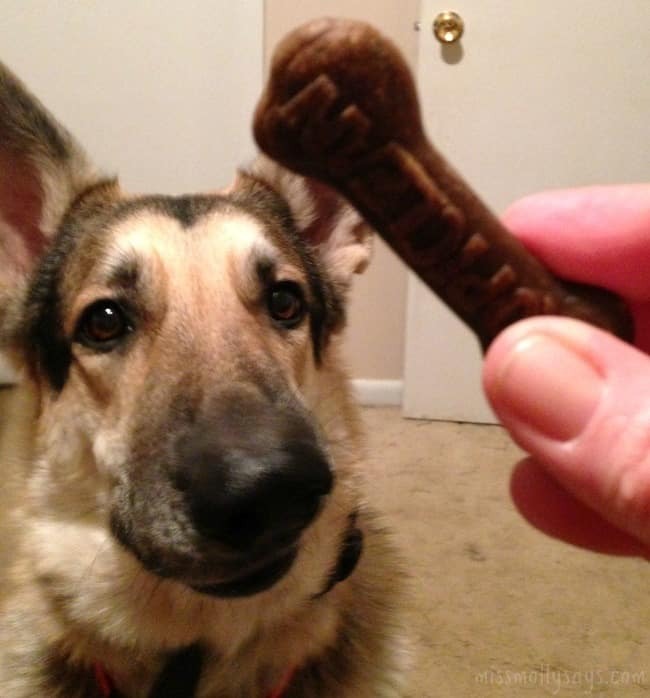 Those things are doggone good! WOOF! Ya can bet we are all in line when she passes em out! Then there some gel stuff that she puts in our mouth. It ain’t much – just a couple of drops on each side, but she says it’s good for our teeth and breath too. Don’t let my pearly whites blind ya now! I know they are shinin’ purdy bright these days and my Lady says my breath smells lots better! I’m glad cause I like smoochin’! I think I even feel better with my mouth all clean and smellin’ good. After all, don’t you feel better with a clean mouth?! My Lady has already told ya all about the TropiClean Water Additive we’ve been a usin’, but I want to let her tell ya about these new Dental Chews and Clean Teeth Gel too! As you know, we have been really excited over the TropiClean Water Additive for the pets dental care! It’s hard to stop gushing over it long enough to tell you about the other products in their arsenal that we’ve been trying. I have to tell you, the excitement hasn’t stopped! For starters, did you know that TropiClean has been passionate about creating natural, healthy products from the very beginning? Natural and healthy are magic words for me! I think I mentioned to you before, but did you know that 80% of dogs and 70% of cats show signs of periodontal disease by age three? Just like in humans, if it is left untreated, oral disease can seep into the blood stream and cause serious health risks! Yikes! Our pets can’t exactly tell us when their teeth or gums hurt, but one of the first signs of oral disease is bad breath. The bad breath part grabbed my attention, because who hasn’t, at some point, smelled their dogs breath and it smell like road kill? Whew! Sometimes it may be only be a matter of the dead frog they found and played with and other times it can definitely be a serious matter, especially if their bad breath is an ongoing thing. Their overall health all comes back to their mouth and teeth! A healthy mouth is equal to a healthy heart. This in turn helps your pet live a long and happy life. Let me tell you about a couple more of their products that will make your life easier and your pets healthier! The TropiClean Dental Chews were a favorite all the way around – for the puppies and me! TropiClean Dental Chews is an advanced cleaning system that features a unique design which uses the mechanical chewing action to simulate brushing and help reduce plaque and tartar. The dental chews have wholesome ingredients such as flaxseed, which works as an abrasive against tartar and plaque. They also include baking soda and parsely, which acts as a breath freshener. In addition, they also include Jinsei Green Tea Extract that promotes dental wellness. 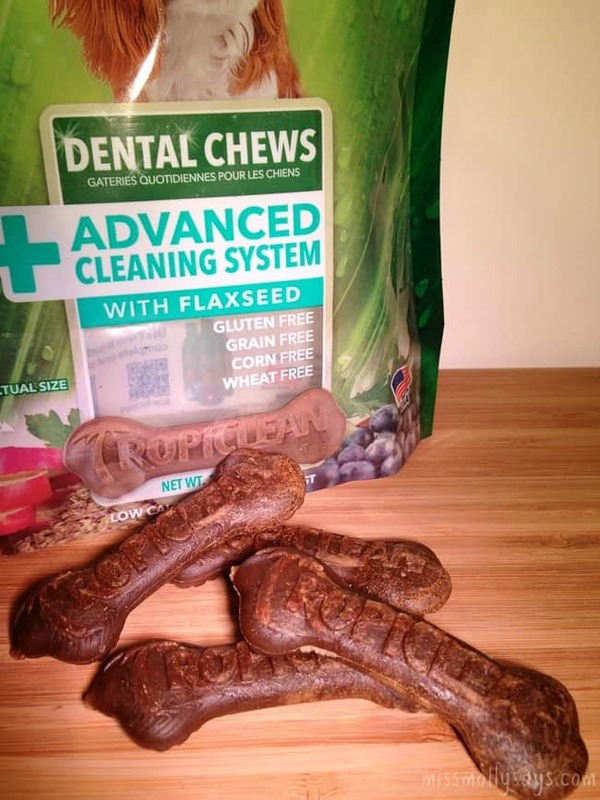 The TropiClean Advanced Cleaning System Dental Chews are gluten free, grain free, corn free and wheat free. And, of course, they are made in the USA. The ones we received to try out were size small, yet look at the size of these! They are an ample size chew for even my largest dogs. However, I only give a half of one to my little 5 lb chihuahua. Maggie isn’t snarling or smirking in the pic. She actually was licking her lips looking at the treat and I wasn’t fast enough on the picture taking side of it. Her, and the whole pack, love the dental chews! I was amazed to see Maggie take such an interest in a dental chew. She is the very one I talked about not being interested in chews – go figure! They must be delicious for Maggie to give her stamp of approval to them! She’s happy and I’m happy! We have been using the TropiClean Water Additive daily in their water and all the dogs are allowed a TropiClean Dental Chew each day. 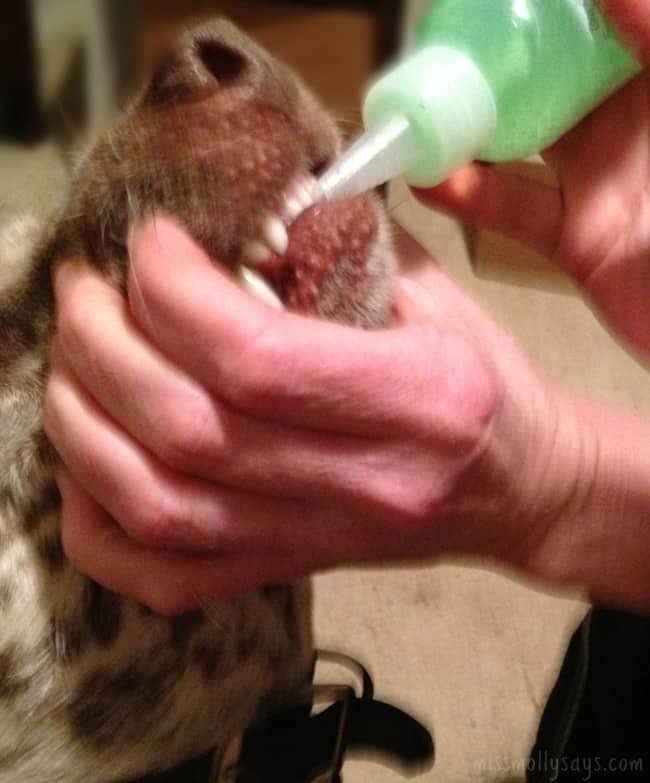 We have also been using the TropiClean Gel a few times a week for most of the dogs. It’s about as much as I can manage with my pack of 7 dogs. Maggie’s teeth have shown definite improvement in her dental health, along with her breath. I wanted to mention the TropiClean Clean Teeth Gel also. 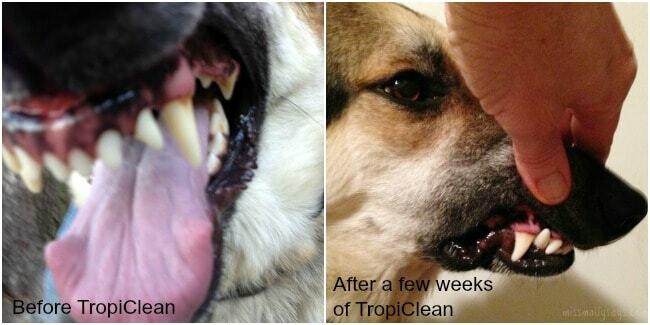 The TropiClean Gel is also a natural holistic product that works fast and naturally to help reduce plaque and tartar on dogs and cats, with no toothbrush required! The gel kills the germs that cause bad breath, plaque and gingivitis. It also soothes minor gum irritations. The gel is great if your pet doesn’t mind you in their mouth. For me, the gel is a little harder to use because of all the activity around with 7 dogs. There never seems to be a calm moment in my house! Plus, I have two dogs that turn into terrors if you go near their mouth. Molly doesn’t mind my hands in or around her mouth, however, she just can’t seem to sit still. To use, you just get right in there and apply a couple of drops directly to the teeth. Don’t allow them to drink or eat for about 30 minutes and that’s all there is to it! Anyway, the dental routine that has been working for me is to use the Clean Teeth Gel a few times a week. It’s about as much as I can manage with my pack of 7 dogs. In addition, we have been using the TropiClean Water Additive daily in their water and then all the dogs are allowed a TropiClean Dental Chew each day. This simple dental solution is working and I am tickled to death with the results! Maggie has shown definite improvement from a few weeks ago! Her breath is certainly a lot better also. Who would have thought pet dental care could be so simple?! In case you missed the post back when we first started our new dental routine with Tropiclean, I wanted to show you the difference in what a few short weeks have made. On the left you see the plaque and tartar buildup starting on the gumline and on the jaw teeth. On the right, and in the photo above this one, you can definitely see the improvement! I know you can’t see the jaw teeth in the pic on the right, but notice the canine tooth up front – defnitely better! I can only imagine how nice her teeth will look and her breath will be as we keep her on the routine! Being able to visibly see the difference is what has me so excited and singing TropiClean’s praises from the rooftop! As an added bonus, 5 of my dogs all had their wellness checkup at the vet’s this past week and even the vet noticed the difference in their teeth and breath! I felt like I had been handed the golden seal of approval award! I will be honest and say that brushing 7 dogs teeth is just not a doable thing for me. Most of my dogs are as big, or bigger, than I am and that’s a wrestling match I don’t care to get into every day. However, either adding a water additive, giving them a dental chew and putting a couple of drops of gel in their mouth (or all three alternatives) is definitely something I can do. Not only will TropiClean products keep their breath fresh and their pearly whites shining, it will keep them healthy! Do you have a dental routine for your pet? Does the TropiClean products sound like something that you might like to try? I can definitely tell a different in the color of your pups teeth. I wouldn’t mind giving it a shot, especially since it’s a holistic approach. I have not tried any of them yet but already have plans to get the water additive. After reading this I am going to ask my vet about the gel also. I wish they had samples as my dog is really picky. No ma’am! The water additive and the gel is also made for cats. I’m not sure cats enjoy the dental chews and it isn’t specified to my knowledge. However, the water additive and gel is so easy to use, it would be great for your kitty! I think that the “Water Additive” is a GREAT idea!! No matter what,an Animal drinks Water & to add the Additive is the easiest way to keep an animal’s Teeth Clean without the Hassle. Yes, looks easy to do, and that is the selling point. I think I would like to try this with my dog, I want him to have good dental health. My dog needs this! Brushing her teeth is like diapering a tiger! I do brush my dogs’ teeth regularly, but am still always looking for other ways to keep their mouths healthy- this sounds great! Yes I think this would be a great option for my pets. Anything that helps keep my pets mouth clean is a go, providing the weight gain isn’t a problem. My chihuahua was putting on extra pounds when he was getting a daily Greenie, so we cut back to 3 times a week. I use the TropiClean clean teeth gel & that stuff is great & my pets like it, not the foam, which I thought would be easier for them & myself. Pet mouth health is whole body health. I use the TropiClean water additive for my dogs and cats, and it truly delivers on its claims. 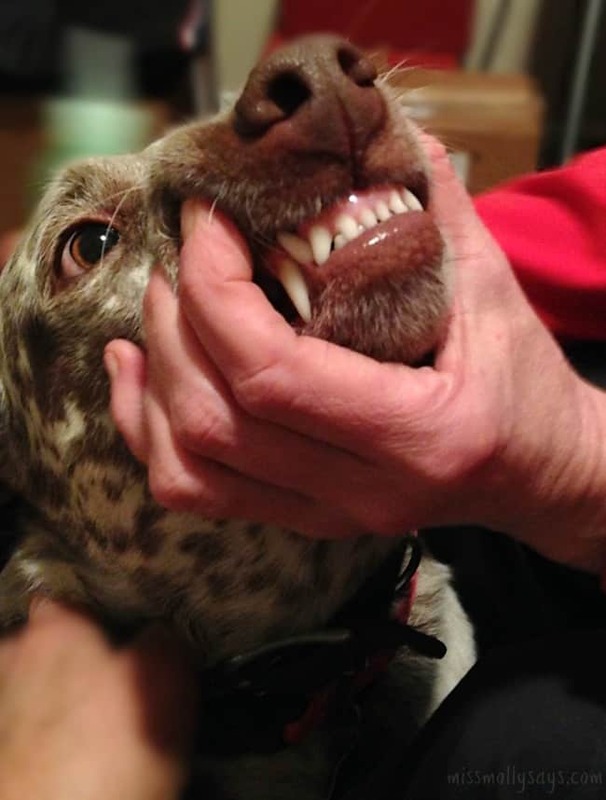 Your dogs’ teeth look awesome! Though my dog would never use the chews, I am definitely interested in the water additive and the gel. I visited their site and I see that they can be purchased at Petco. I’ll be getting some very soon. Thanks so much for the heads up! I am tickled to death with the TropiClean! My pugs are getting yellow teeth and Tilly’s breath is ruff. 😉 Pete has allergies so the chews might not be OK for him but the gel and water additive sound great …. I’d love to try something, soon! 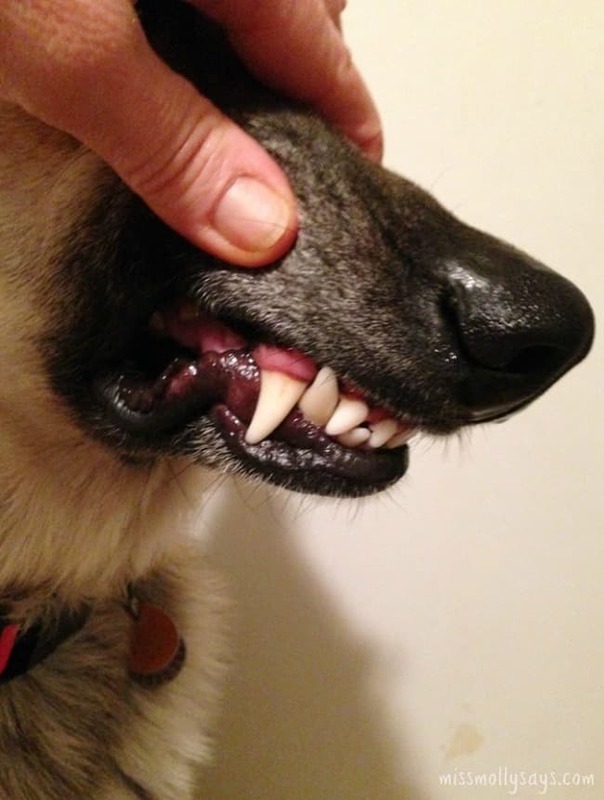 I am amazed that periodontal disease is evident in most dogs and cats by age three! All the more reason to use these great TropiClean dental products! I definitely need products like these for my dogs. They don’t like getting their teeth brushed and are very food-oriented, so edible dental treats work really well for them. The Dental Chews are definitely an option I think would work with our dog. I’m not so sure I’d use the gel, though. But your results are pretty hard to argue with! Thanks for the thorough review. It is not easy brushing the dog’s teeth! This looks super easy and I bet it’s yummy for the dogs too. I have tried brushing my dogs teeth with out much luck. We have used different chews thru the years. Would love to try a holistic approach instead of dental cleaning at the vets every few years that requires anesthesia. My dogs would love the chews I don’t know about the gel but I’m willing to give it a try nice to read your review on both of them. There are a few dogs in my life that could use this product. Great review! I brush my dogs’ teeth and then I give them a dental treat. This routine keeps their teeth in great shape and their breath fresh. I think this would be a great routine for a lot of dogs, but I’m not sure if my sassy little Rosie would let me fuss to brush or put the gel in her mouth. But since both of my dog’s breath is horrid, I would love to try it! Easy is what I need since I have five dogs, two cats and a 2year old granddaughter to raise. I could do this routine. Wow, I have to tell you that it’s a big improvement on Maggie teeth. I was a vet assistant to a Vet that did dental work on dogs, so I have seen some ugly doggy mouths. You should be proud. Both your pups have great looking teeth.